Today, April 4, marks the 44th anniversary of the assassination of Dr. Martin Luther King Jr., and the strike by the sanitation workers of American Federation of State, County and Municipal Employees Local 1733 — two events that changed America and forever linked civil rights and workers' rights. For the members of AFSCME in Memphis, Tenn., and across the country, this is a day that holds special significance. The events we will commemorate represent both a high-water mark in our fight to ensure that all workers have a voice, and a violent end for a truth-telling, eloquent leader who was simultaneously one of our nation's greatest champions and fiercest critics. This year also marks the 75th anniversary of AFSCME. The state workers of Wisconsin who formed our union at the height of the Great Depression wanted the basics: better pay and better working conditions. But, just like the sanitation workers who went on strike in Memphis in 1968, they also wanted respect. Those Wisconsin state workers banded together to form this union because they understood that as long as their jobs were subject to the patronage system and dependent upon whom they knew instead of what they knew, they had no rights and no voice at all. Decades later, it was that same desire to be treated with dignity and respect that compelled the sanitation workers of AFSCME Local 1733 to stand their ground. They could have gone along with the status quo, complaining only to one another about unsafe working conditions, awful pay and nearly nonexistent benefits — especially given the daunting twin evils of racism and poverty they faced. It is always our choice whether to accept what we are given or demand what we deserve. The sanitation workers of Local 1733 chose to make a demand. It was difficult for them, as it is for any workers who stand up to powerful interests. Dr. King was drawn to their fight because he understood that workers' rights, human rights and civil rights are intertwined. His perspective was that they could not be viewed separately or pursued as individual aims. Believing in one meant believing in — and fighting for — all. On the night before his death, he told a huge crowd gathered at the Mason Temple in Memphis: "You are demanding that this city will respect the dignity of labor. So often we overlook the work and the significance of those who are not in professional jobs, of those who are not in the so-called big jobs. But let me say to you tonight that whenever you are engaged in work that serves humanity and is for the building of humanity, it has dignity and it has worth." We all know what happened in Memphis 44 years ago today. 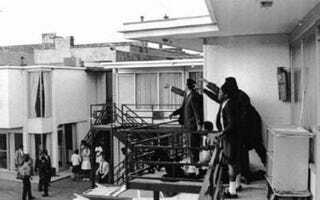 Dr. King, standing on the balcony of the Lorraine Motel, was assassinated on the day he was to lead a march through the city. Less than two weeks later, the sanitation workers won an agreement with the city that recognized their union and provided better pay and benefits. The strike was settled, but at a terrible price — a revered leader was lost. The strike of Local 1733, and Dr. King's involvement in it, had an impact well beyond Memphis. It forced citizens to notice the workers in every community who are taken for granted, but whose labor is essential. And it also reinforced the principle of solidarity — that workers have the greatest bargaining power and leverage when they act in unison. A year ago, the U.S. Department of Labor enshrined the Memphis sanitation workers in its "Labor Hall of Fame" for taking collective action. They were the first group of workers ever to be honored by the department. Their strike — and its aftermath — continues to inspire members of AFSCME to view our struggle for fairness and a voice on the job through the prism of a broader movement for justice. That's why AFSCME and the labor movement took part last month in the re-enactment of the Selma to Montgomery march of 1965. The original march, led by Dr. King, called attention to the poll taxes, literacy tests and other obstacles Alabama officials employed to keep black citizens from voting. This year's march focused on the 21st-century voter suppression laws, in Tennessee and elsewhere, that make it more difficult for citizens to vote. Rodriguez Lobbins, a sanitation worker who was at the re-enactment march representing the hundreds of Memphis sanitation workers, said he was there "to stop those forces that want to roll back Dr. King's work and the progress we've made over the last four decades." Today, we can honor Dr. King and the sanitation workers by continuing their struggle, adding our own forceful voices to the intensity and passion of theirs. Chad Johnson is executive director of AFSCME Local 1733 of Memphis. Lee Saunders is secretary-treasurer of AFSCME International.